Pâte de fruit is a refreshing fruity treat. The mixture of fruit with some acidity is great to cleanse the palate after a meal. Raspberry pâte de fruit is shown here as an example, but it is possible to produce a wide variety of flavors of pâte de fruit. See the chart on page 89 for the ingredient quantities and desired cooking temperatures for a range of different pâte de fruit flavors. If using a less acidic or flavorful fruit, citric acid can be added to the sugar used to coat the pâte de fruit, to give it a more refreshing mouth feel. Tartaric acid is added to help gel the pectin. 2 Bring the puree to a simmer. Stir in the sugar and pectin mixture. Bring the mixture to a boil, then add the glucose. 3 Cook to 225&F/107.2&C (or to the desired temperature for other flavors, based on the chart on page 89). 4 Meanwhile, mix 1 part tartaric acid with an equal weight of boiling water and bring to a boil. 5 Remove the puree mixture from the heat and stir in the tartaric acid solution. 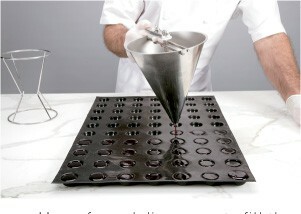 – Use a funnel dispenser to fill the mold cavities with the pâte de fruit mixture. – Umold the hardened pâte de fruit. – Coat the finished candy with sugar. 6 Pour the mixture into a funnel dispenser and fill the cavities of a silicone mold. 7 Let the cast mixture set at room temperature until hardened, about 2 hours, before unmolding. 8 After the pâte de fruit has hardened, remove the candy from the silicone mold by inverting the mold and pressing on the back of each cavity. 9 Place the candies in a bowl of sugar and toss to fully coat all sides. Store at room temperature. To create a different shape, pour the pâte de fruit mixture between framed metal bars resting on a Silpat instead of dispensing into a mold. Let set until hardened, about 2 hours, then remove the metal bars and sprinkle sugar over the pâte de fruit. 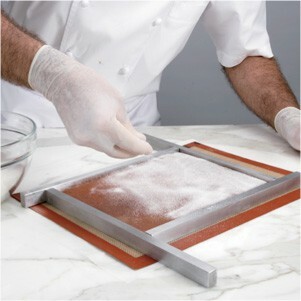 Place a metal tray on top of the sugared pâte de fruit, then carefully and quickly flip it over. Remove the Silpat and move the pâte de fruit onto a guitar base. The granulated sugar on the bottom will assist in moving the pâte de fruit. 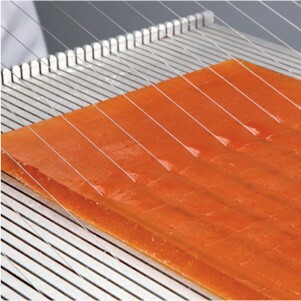 After slicing, slip the tray under the slab, rotate 90 degrees, remove the tray, and slice again to create squares. Alternatively, the pâte de fruit can be cut into other shapes, if desired. Finish by tossing the cut squares in sugar as above. 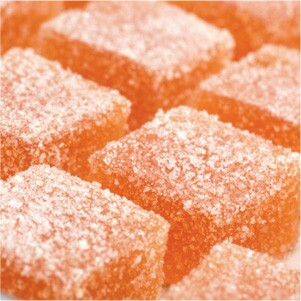 – Sprinkle sugar over the slabbed pâte de fruit created using metal bars. – Slice the slab on a guitar. – Finished slabbed pâte de fruit. The chart below shows the ratio of ingredients needed to create a wide range of pâte de fruit flavors.